We knew it existed but now it's finally crawled out of some jungle to go official. Samsung's Galaxy S5 Active is available today on AT&T and something compared to flagship devices, this time it looks like no notable corners were cut. The body is water, dust and shockproof with its IP67 and MIL-spec 810G certification. The standard Galaxy S5 was already two of those things but some people will definitely appreciate the extra peace of mind that comes from a ruggedized phone. 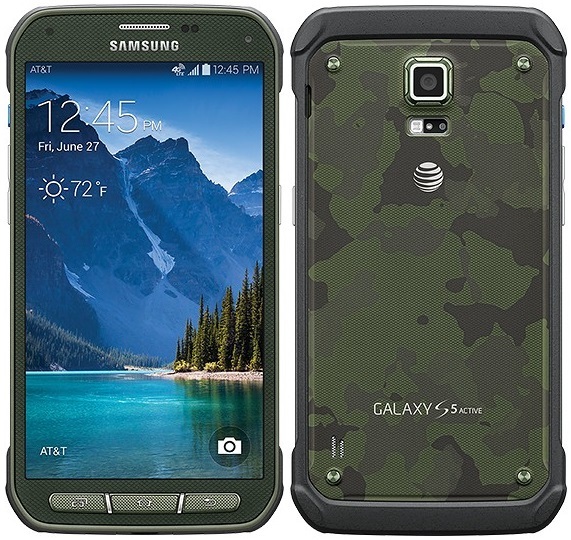 The Galaxy S5 Active has the same full-HD AMOLED 5.1-inch screen, while the 16-megapixel camera and fingerprint sensor are also lodged into the rugged smartphone. That said, water-resistance is now part of the original GS5's bag of tricks, which makes it less of selling point here. Regardless, there's the shock-resistant dust-proof shell and a burlier look: even if it's dreamy rendered view we're seeing here, the metallic details and finish could well win over Galaxy fans that aren't pro-plastic -- we're a little intrigued to see it IRL.